Looking for a Magician's Table? Something ideal for a home party or parlor-sized show? 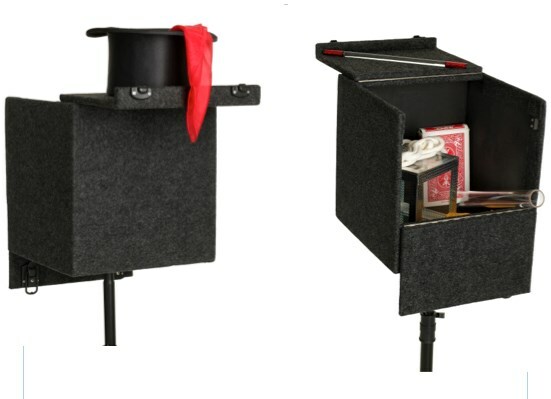 The Cube Table, originally designed by the late, great Hank Moorehouse, is ideal for professional magicians and variety entertainers. It's versatile, lightweight and professional. Check out the photo to see how great the Cube Table looks on a table base that we sell separately. You can use the Cube Table with any table base that has a 1/2" thread connector, or you can order the Ultimate Table Base separately from AmazeKids to be assured that your Cube Table will work for you "right out of the box." Get the Hank Moorehouse Cube Table and get a practical solution to transporting your props, keeping them out of sight until you need them. Best of all, it makes you look like a pro.